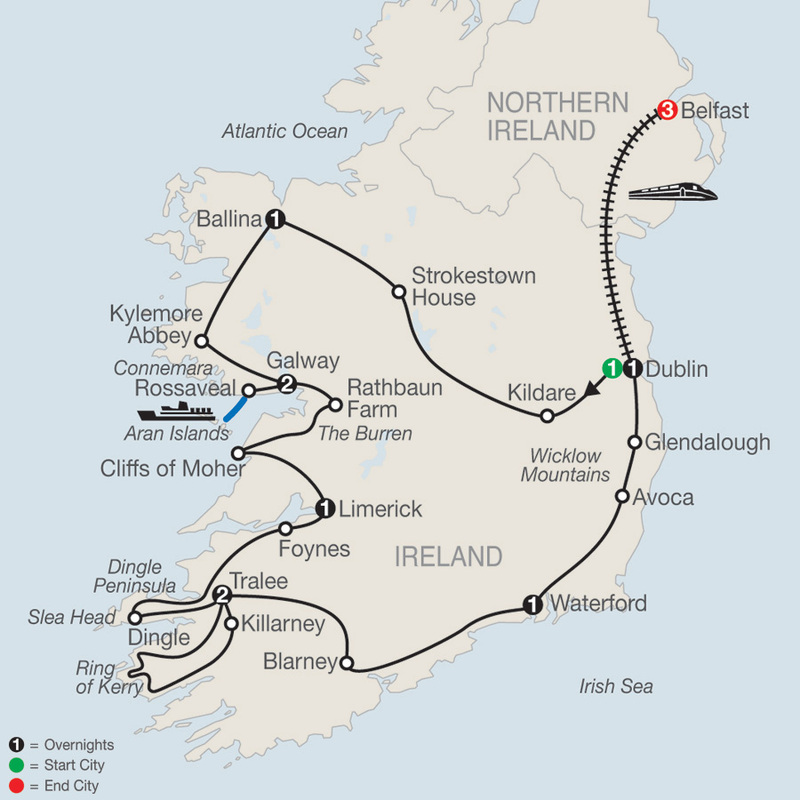 Ireland's history dates back to 6,000 BC and with its breathtaking landscapes, rocky shorelines, vibrant cities, and historical sights, there is something for everyone. 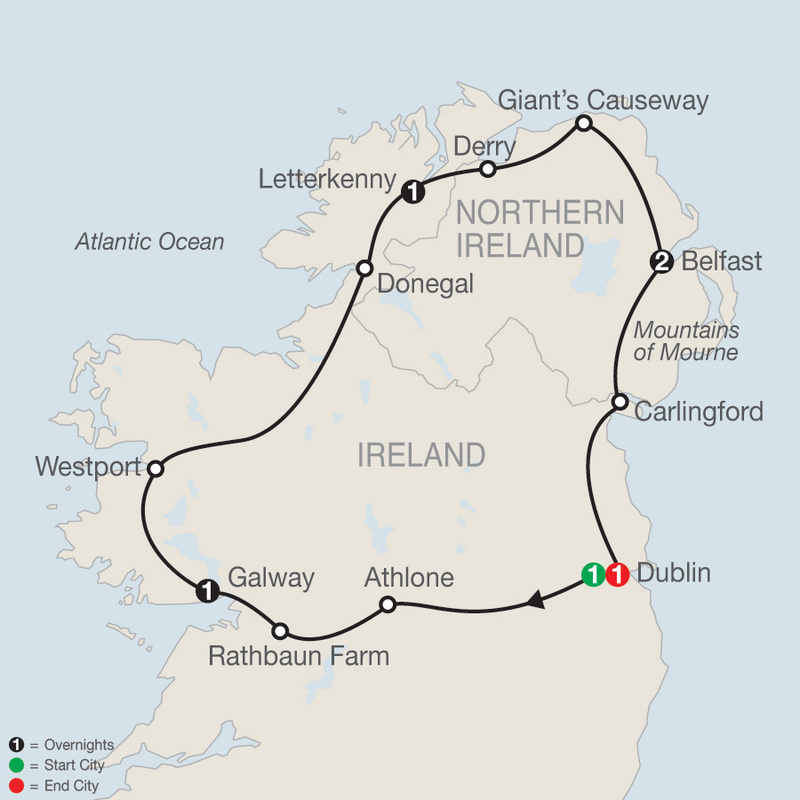 On Globus tours of Ireland, you'll see Ireland's amazing scenery, including the 668-foot Cliffs of Moher; the spectacular Ring of Kerry with its sparkling seascapes, winding lanes, and mountains dotted with brightly colored farmhouses; and awe-inspiring Giant's Causeway in Northern Ireland. 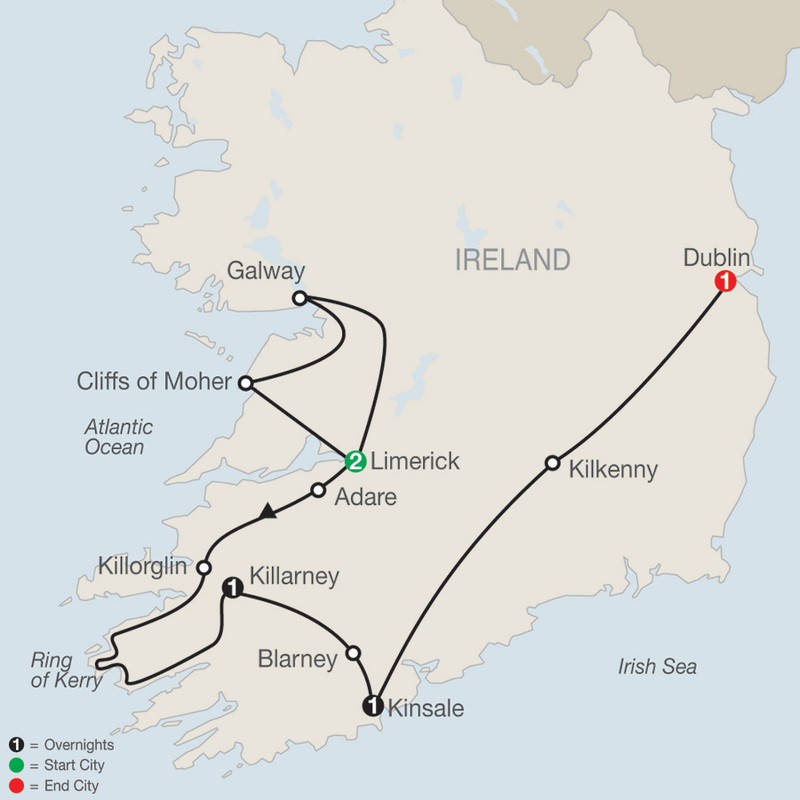 Kiss the legendary "Blarney Stone," visit the House of Waterford Crystal, and explore Ireland's exciting cities. But we don't stop there. 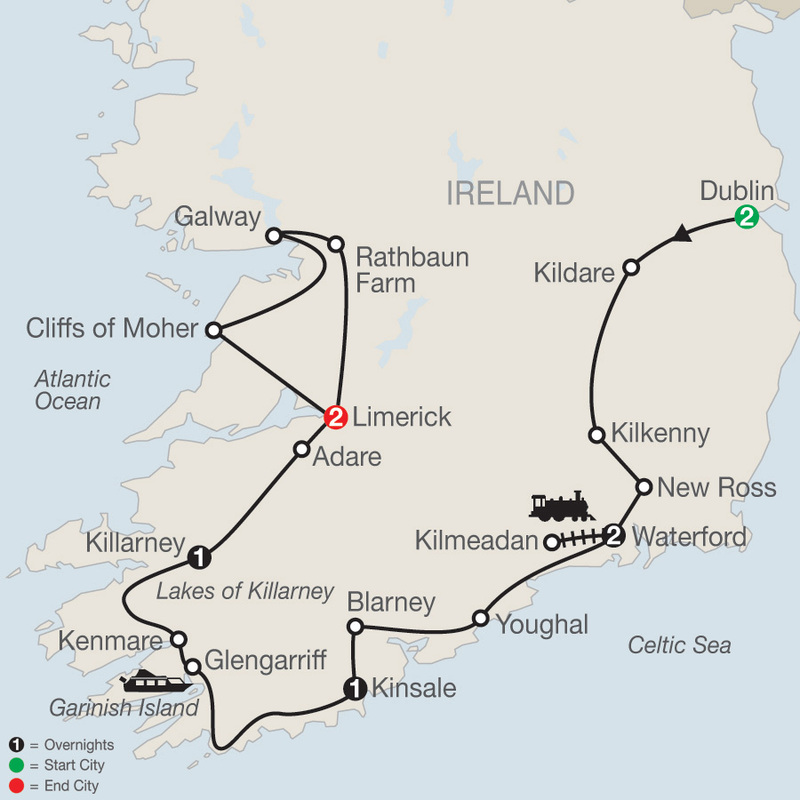 We also include unique experiences in each Ireland tour package, such as a horse-drawn jaunting car ride through Killarney's national park and a baking demonstration at a typical Irish, family-run farm guesthouse. 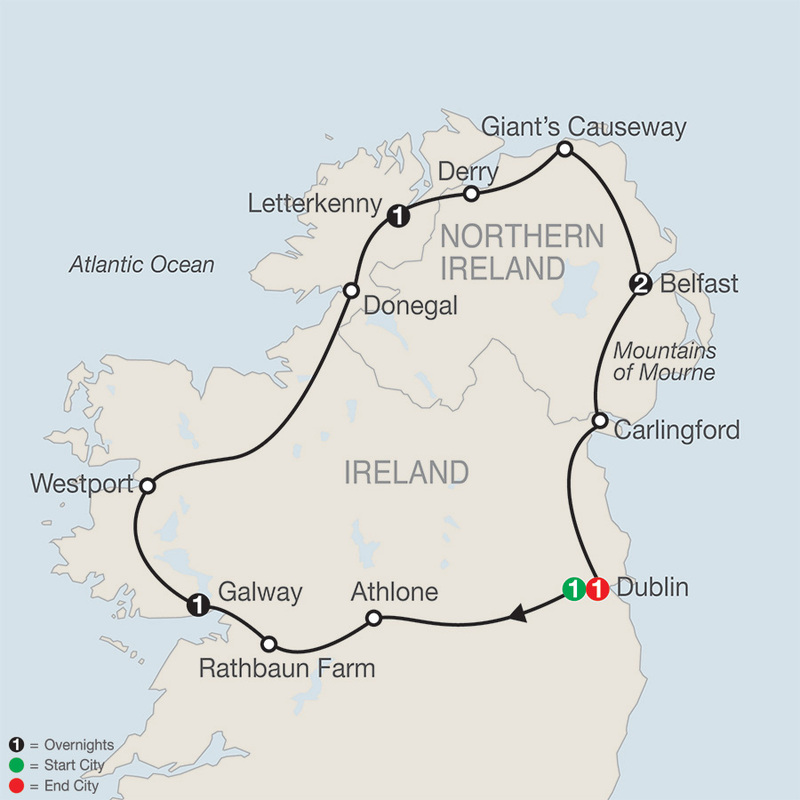 Let Globus handle the logistics and details, so you can experience Ireland at its fullest on one of these guided Ireland tours. 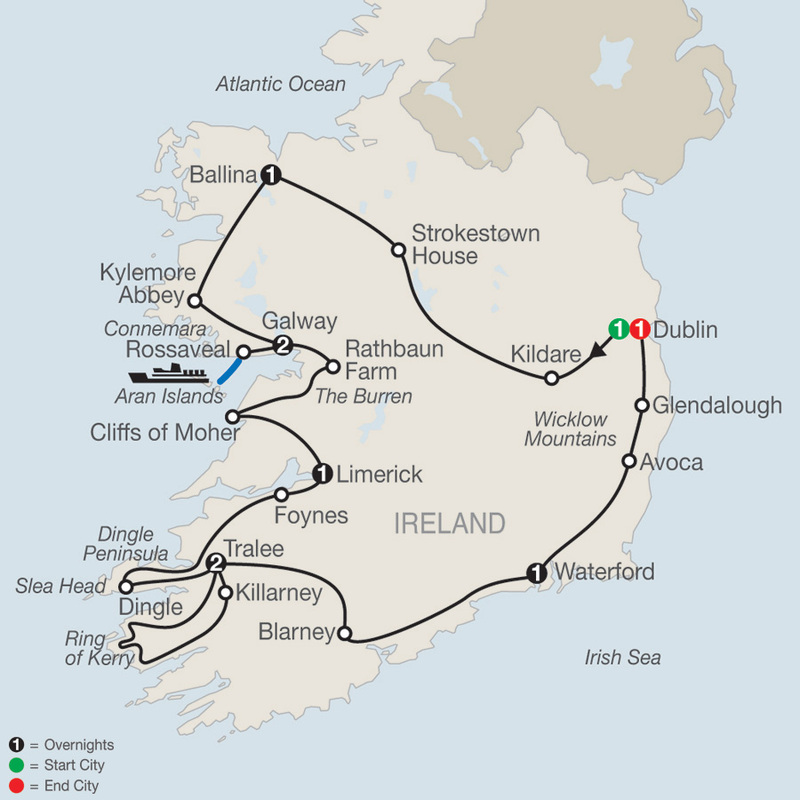 This Ireland tour is an ideal introduction to the Emerald Isle for first-time visitors who have limited time. 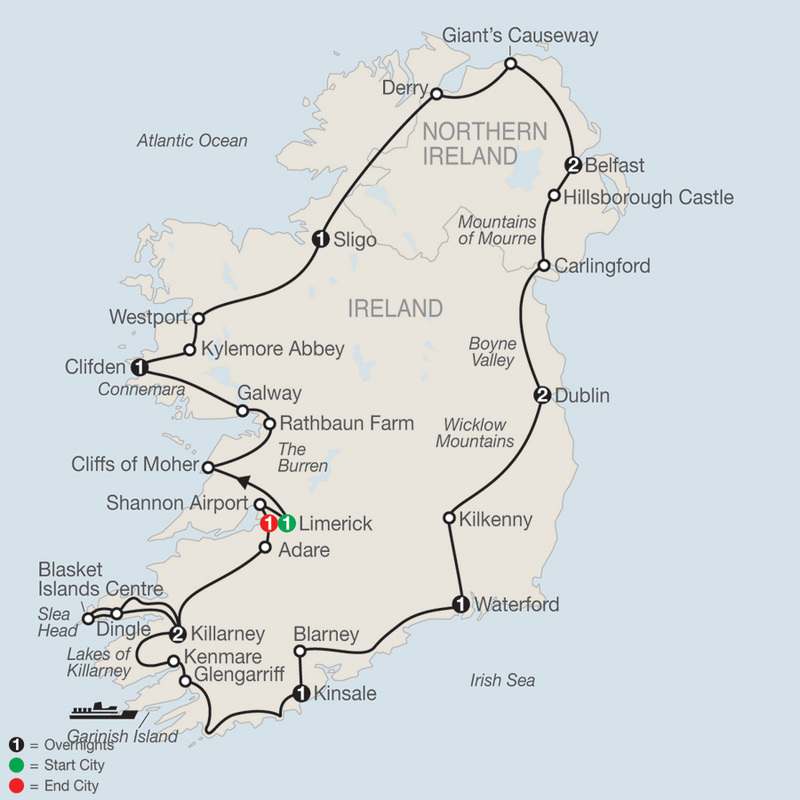 You’ll experience some of Ireland’s most magnificent scenery as well as its most famous towns. 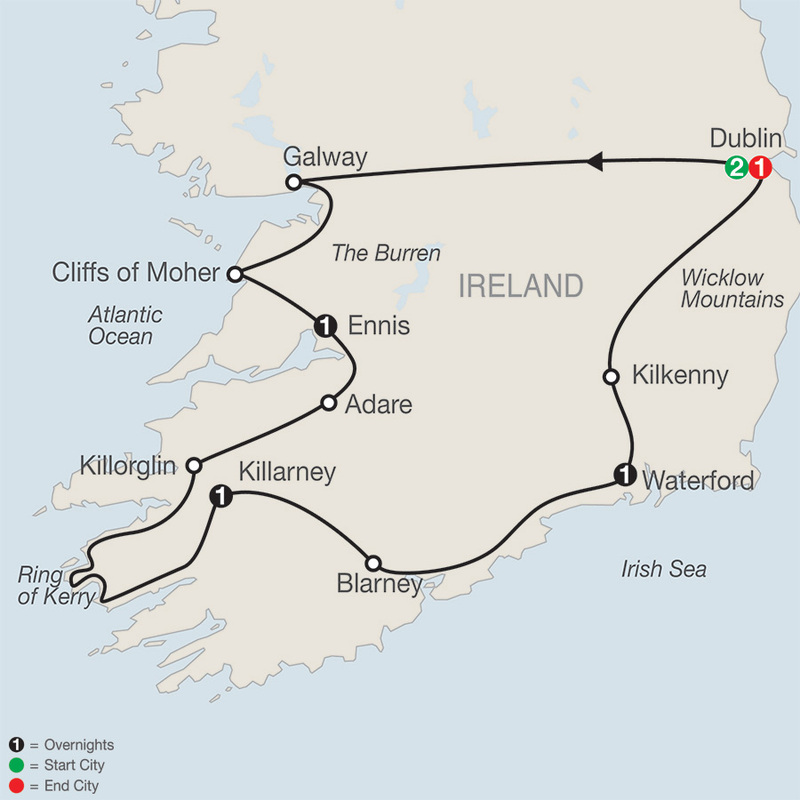 You’ll start and end in Dublin, and you’ll also overnight in Ennis, ...Read More. 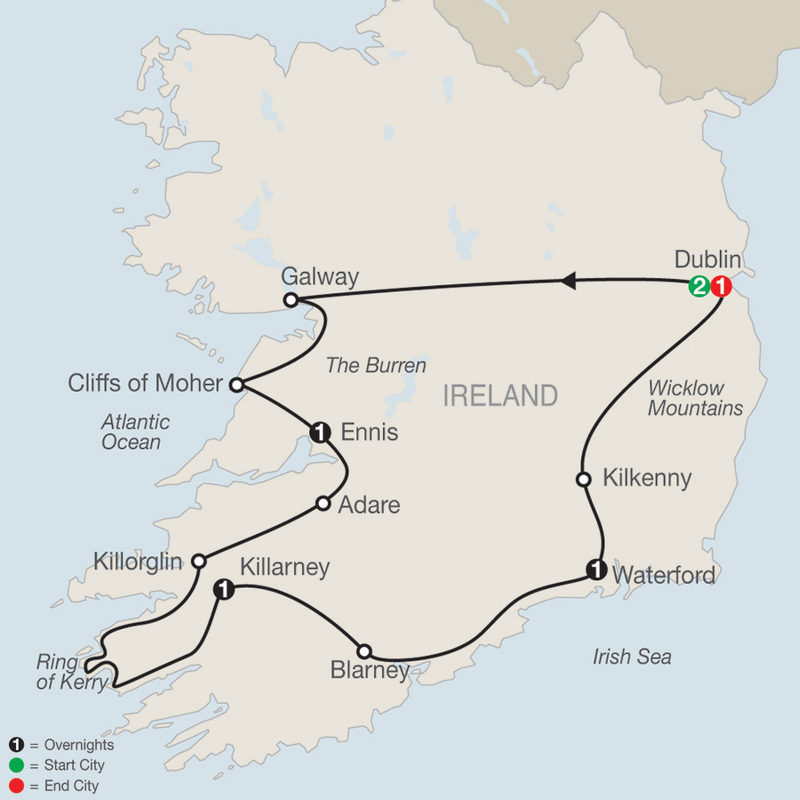 This Ireland tour—traveling from its east coast to its west coast—features Ireland’s most popular cities, small towns, and scenic highlights. Your tour starts in Dublin, ends in Limerick, and overnights also in Waterford, Kinsale, and Killarney. Scenic highlights include the ...Read More. 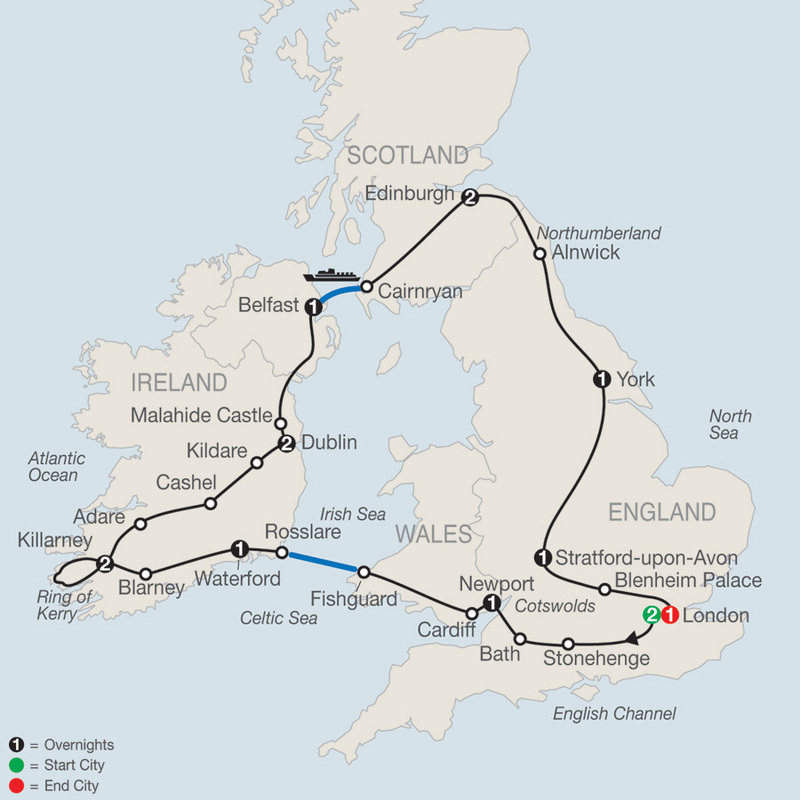 Spectacular scenery combined with fascinating architectural remains and energetic cities—all of this awaits you on this fabulous Britain and Ireland tour. 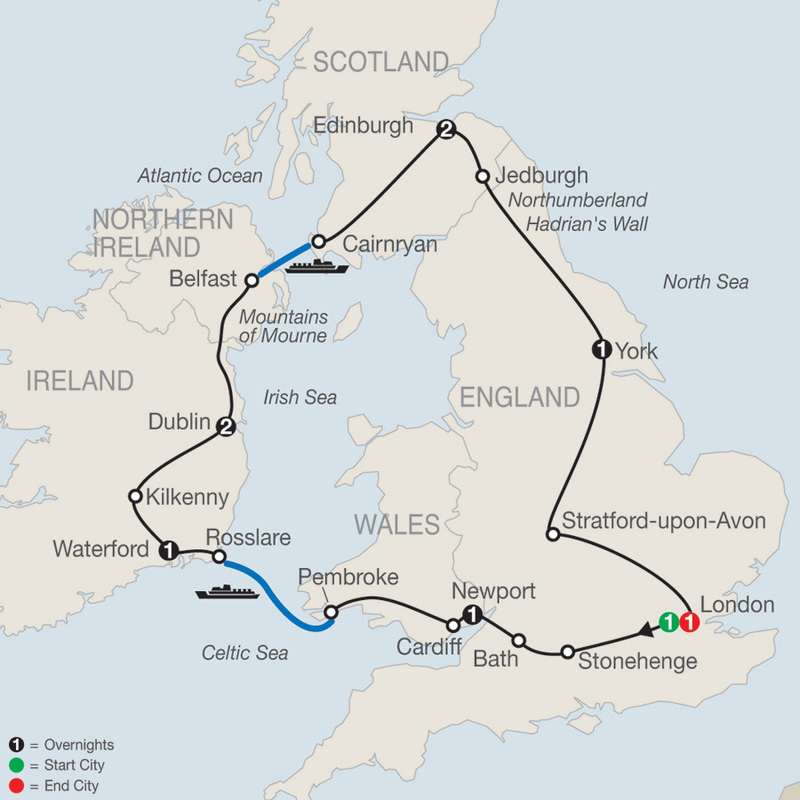 Your tour starts and ends in London with overnights in between in Newport, Wales; Waterford and Dublin in Ireland; ...Read More. When you think of a vacation to Ireland, what comes to mind? Witnessing the lush, green landscape? Visiting historical and religious sights, and seeing remains from medieval times? Perhaps it is visiting farms or savouring authentic Irish food. If so, all of this and more are ...Read More. Breathtaking, lush landscapes combined with vibrant cities and historical attractions—all of this and more await you on this Scenic Ireland tour, which includes Northern Ireland. You’ll visit some of the most famous cities as well as some of the smaller towns. Along the way, ...Read More. 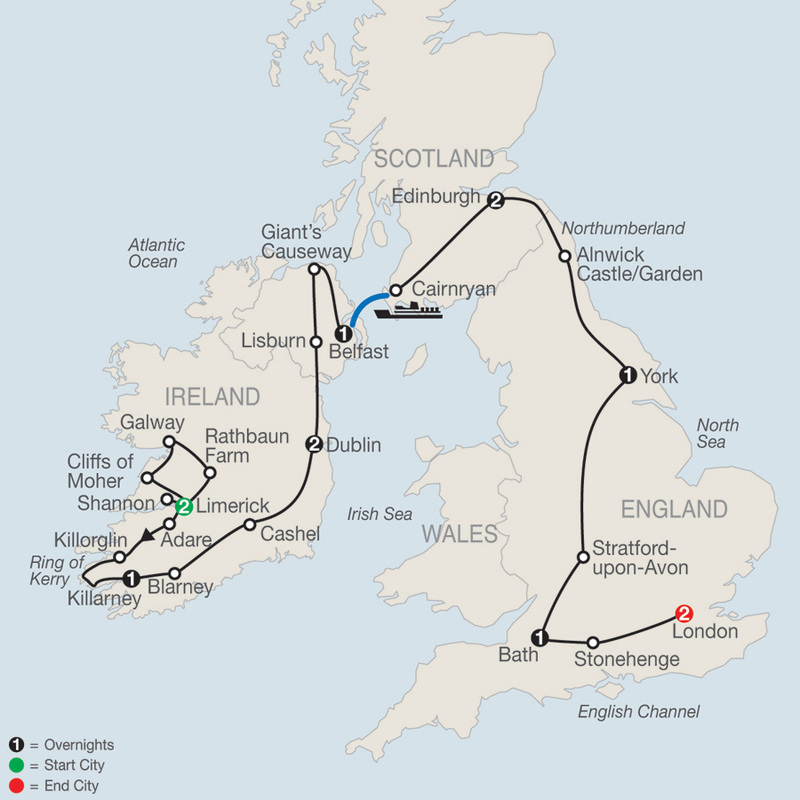 From their breathtaking scenery to their vibrant cities and small towns, this fascinating tour delivers the best of Scotland, England’s Lake District, North Wales, and the Emerald Isle. 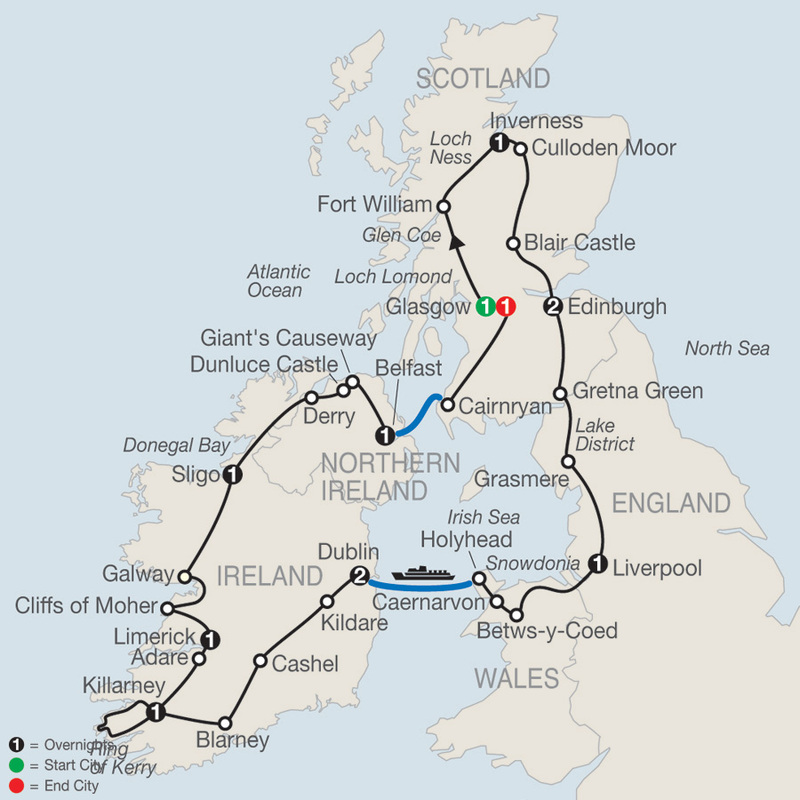 You’ll start and end in Glasgow and overnight also in Inverness and Edinburgh in Scotland; ...Read More. You’ve seen photos of London’s Big Ben—now’s your time to see it in person. You’ve heard about Dublin’s friendly culture—now’s your time to experience it. You’ve read William Shakespeare’s plays—now’s your time to visit his birthplace in Stratford-upon-Avon. You’ve heard of the ...Read More. Vacations to Ireland should include lush, green landscapes; visits to historic and religious sights; remains from medieval times; and authentic Irish food. 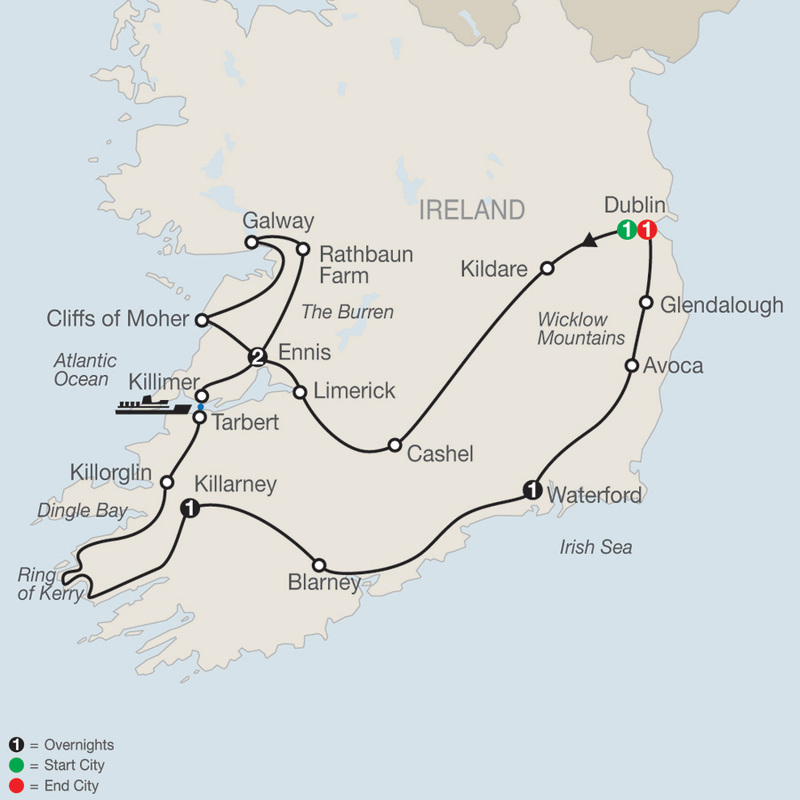 All of this and more are offered on this amazing Ireland tour—with overnights in Dublin, Ballina, Galway, Limerick, Tralee, ...Read More. 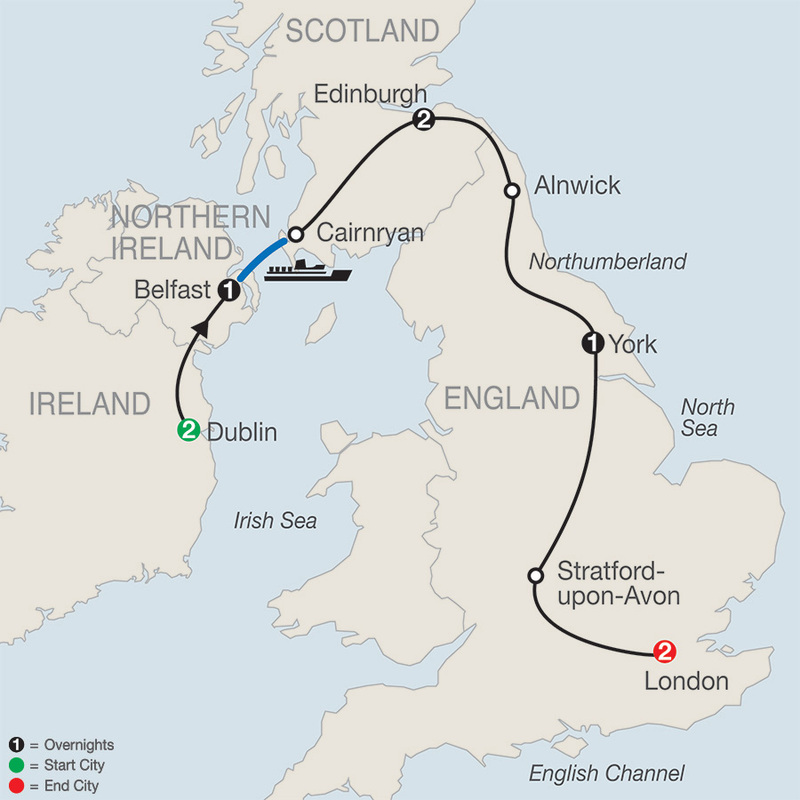 On this Britain and Ireland tour, you’ll see Britain’s & Ireland’s highlights— from the bustling cities to the small towns and from the magnificent palaces and castles to the ancient ruins. Traveling through the lands of queens, kings, and leprechauns, begin and end in London ...Read More. 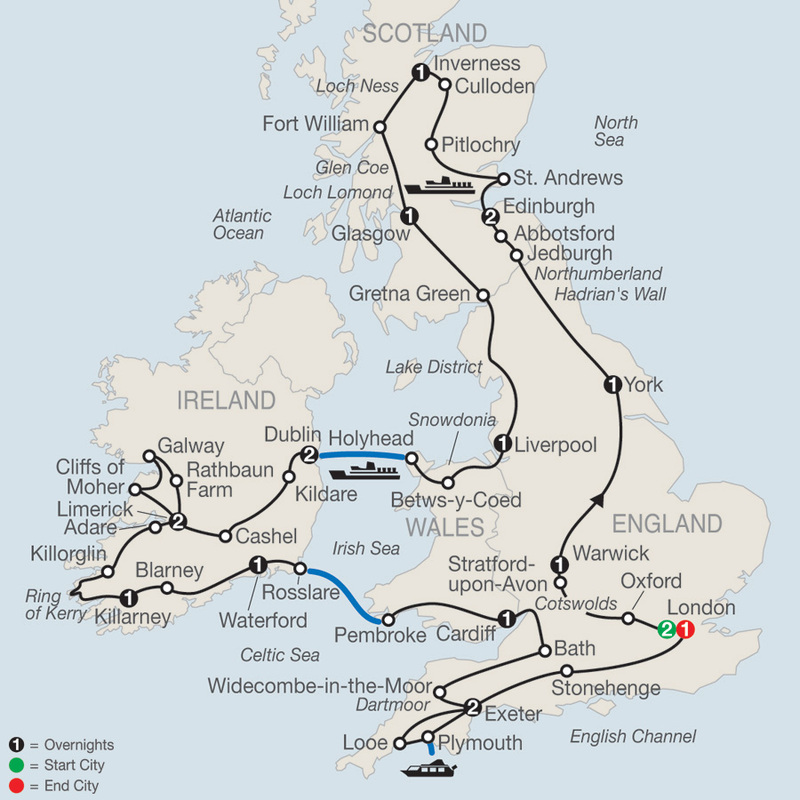 From the lively cities to the breathtaking scenery, discover the very best of England, Scotland, Wales and Ireland on this British Isles tour. 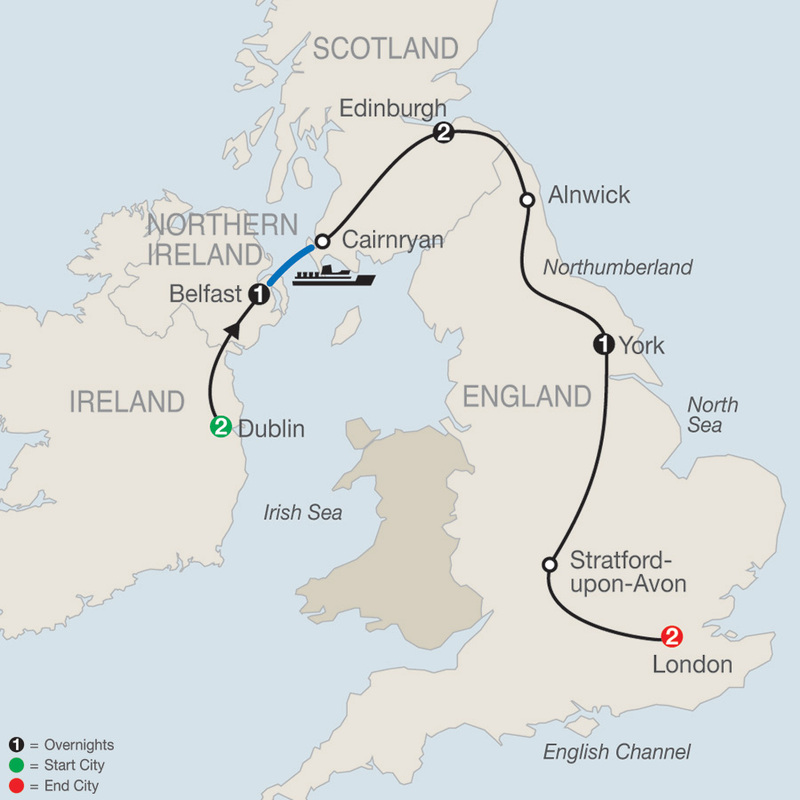 You’ll have 2-night stays in London, Edinburgh, Dublin, Limerick and Exeter as well as an overnight in Warwick, York, Inverness, ...Read More. 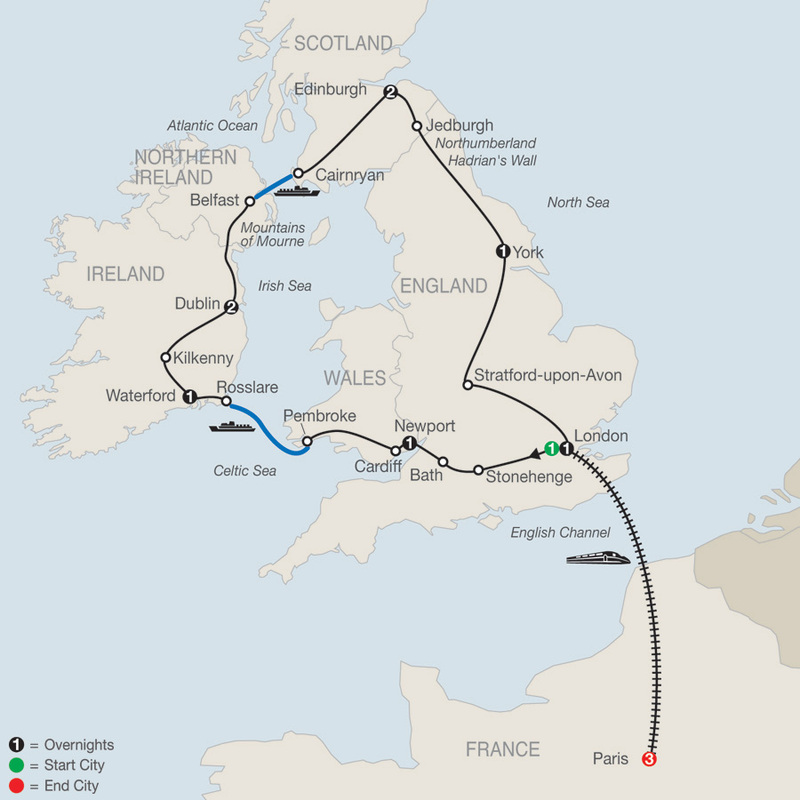 Traveling through the small towns and larger cities, this Britain and Ireland tour is our most complete view of the British Isles. 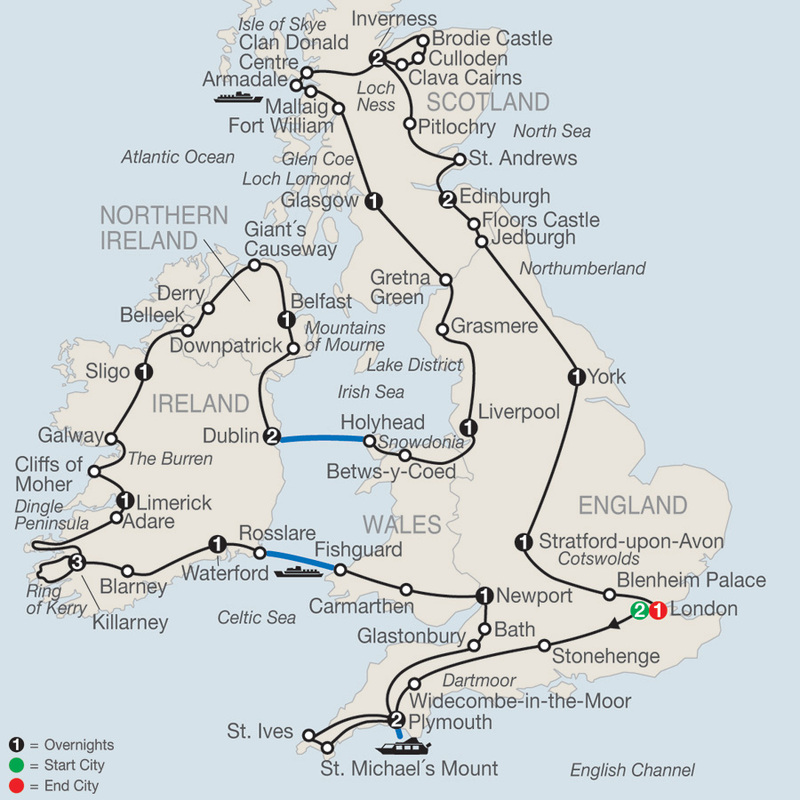 On any tour through Britain and Ireland you’d expect to visit ancient ruins, majestic castles and palaces, magnificent cathedrals, and historical ...Read More.